Have you ever received a gross email? I did the other day. Now, I’m not talking about gross in a spammy, trying-to-sell-me-something-untoward kind of way. But an email with subject matter that makes one’s face contort. I am a pastor and church employee by trade, so I receive a lot of promotional emails on a daily basis for a variety of products and services. Generally, these are welcome in my inbox, as I am always trying to stay current with available resources. But this particular email wanted to teach me how to get rich people to give money in my church. For starters, let me say that the Lord is blessing our church financially and I am in no way seeking ways to raise funds for our fellowship. Secondly, I am with Perry Noble on this topic…. if it is God’s will, it’s God’s bill, so I’m not concerned where money for future ministerial endeavors might come from. But let me just address the concept of targeting a certain socioeconomic group for donations. It isn’t in the Bible. Mark 12v41-44 teaches that giving sacrificially is more desirable than giving out of abundance. 1 Timothy 6v10 states that the love of money is the root of all kinds of evil. Hebrews 13v5 tells us to be content because God will never leave or forsake us. 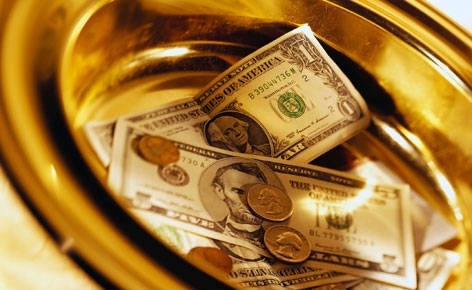 And when we seek to fill the coffers of our churches by our own devices, we are essentially declaring that we do not really need God to provide at all, much less for Him to provide in His timing and by His methods. Who blessed these “donors” with the money they have? Should we as a church be going after anyone because of what they have in their wallets, or because they need Jesus? Are there churches out there that seek out certain people to attend their churches merely because of what they can put in the offering plate? God help them. I immediately opted out of this series of emails (which, for the life of me, I can’t remember how I got signed up for it in the first place). And my face has returned to its usual configuration (such as it is). Do you know of churches that practice this kind of recruitment? Does YOUR church practice this kind of recruitment? Why?